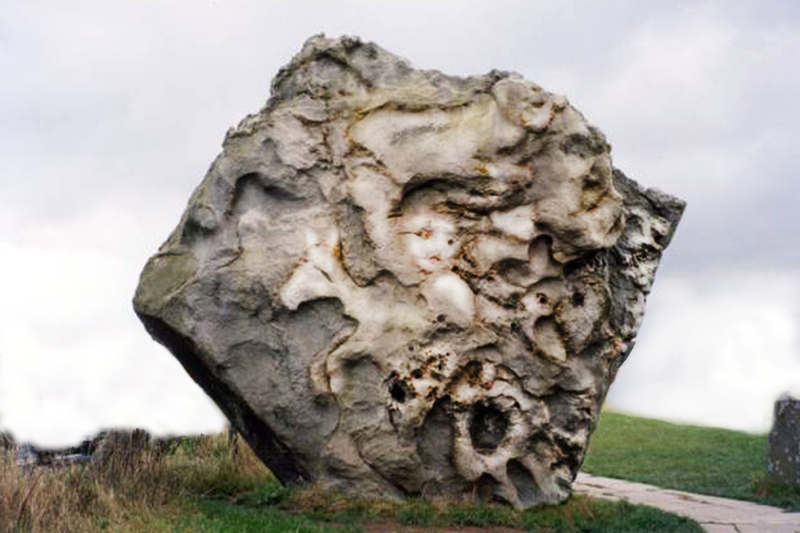 Avebury. The ditch around the stones. Lately I’ve had my mind on traveling. Every few years I get a little antsy, just needing some more excitement in my life and exploring is something that my husband and I truly enjoy. It gives us something to look forward to as well as something new to talk about. After 33 years of marriage, we already know how to read each others minds, so yes, we need to get out and see something other than the usual. We are planning a trip to Ireland in 2014. I know it’s a ways off yet but we are not the types to travel with a group so we search and plan our own excursions. This brought me into looking up the Celts. And with my wandering brain the way it is, I thought about revisiting some of the places we visited a few years ago when we spent 2 weeks wandering around England. This was before my photography career and now I find I am in much need of better pictures. Let me step back just a minute and give you a little background first. I had the luck of being born in Swindon, England. Being the third daughter of a American military family, we just so happened to be stationed there when I arrived. I didn’t get to stay very long as we were state’s side again by the time I was two. Since sisters will be sisters, and I have three, I got the honor of being teased about it my whole life. If anything I did was wrong….it was because I was born there. I learned to enbrace the teasing and made it my own. Many years later I’m finding there are coincidences and family relations that bring me back to England in every direction. And it has nothing to do with being wrong. I recently found out through Ancestry.com that my fathers side of the family, the Westcott’s, have been traced back to Westcott Manor, in Marwood England. And today’s coincidence……the writer of a book about Avebury, is William Stukely, a big possiblity to being another cousing along the ancestry line. I’m definitely have some more exploring in England to do. 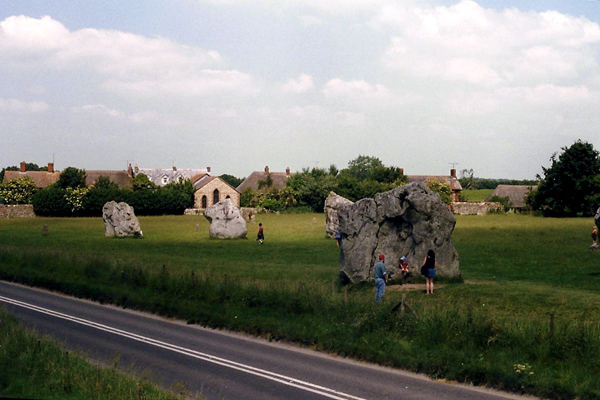 I dug out some old pictures of Avebury, Wiltshire England. Jer and I visited there on our way to Swindon. We hadn’t been looking for it at the time but am forever grateful that our path brought us there. 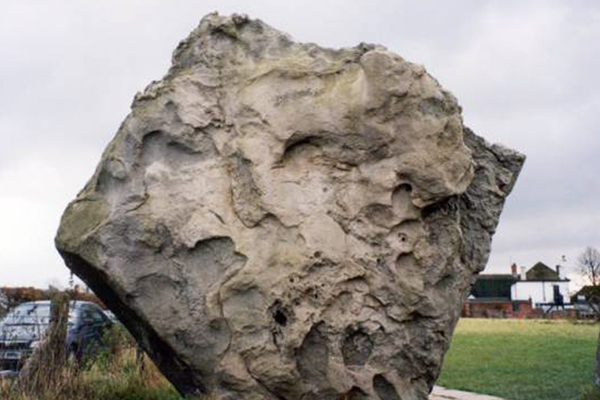 Avebury is much like the popular Stonehenge except you can walk right up to the stones. I distinctly remember reading a small sign on the unlocked farm gate that read, Please keep gate closed so the sheep don’t get out. It felt kinda like trespassing but at the same time, it felt like coming home. 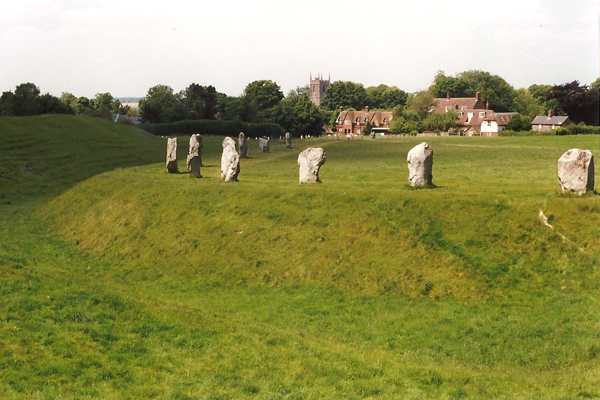 Avebury’s large circle of stones are on 28 acres with this very large deep ditch surrounding the entire area. You don’t realize how big these stones are until you see them in person. You just can’t help but ask that question…How did they get them there? I, like always wasn’t happy with just looking from afar, I had to touch all the stones. I took a picture of Jer by the largest stone I could find. It wasn’t until I got home did I notice that we had picked the Swindon stone. (I believe whole heartily that nothing is by coincidence.) We stayed there for quite a while after that in awe of the stones and the welcoming feeling they were emitting. I really did hate to leave. Today I was look at this image and now I can see what else was with us. Let’s take a look. I downloaded another image from the web so I could see all of the image. Here is the before . Looks like an ordinary big rock right? Well now let’s look again. I’ve just used a little lightening and darkening to the image so you can see what I am seeing. Kinda like burning and dodging like they used to do in the darkroom. Do you see them now? What caught my eye first was the large profile image on the upper right, by the point. Then it continued into much more. I really wish I had a story for all that I see here. I see a goat on the top. A girl almost center. She is above the horse or donkey looking to the left. Along the whole right side are 5 faces as if they are watching who exits the north entrance. On the left I see another large face behind the horse and what looks like a cat yawning towards the bottom. What a great story this rock could tell! Don’t be afraid to play the game. Let that inner child out to play. Have fun. « Do you really know what lives in the water?